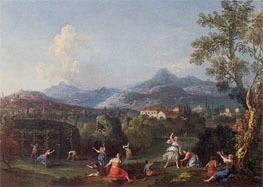 Famed for his Arcadian views and simple pastoral scenes, Francesco Zuccarelli was one of the most important Italian landscapists during the eighteenth century. Although Tuscan by birth, he was to become associated primarily with the Venetian school of landscape painting derived from Marco Ricci. He first visited Venice in 1732, and like Canaletto, was patronized by Joseph Smith, who was then British Consul. When Richard Wilson visited Venice in 1751, he painted Zuccarelli's portrait, and was considerably encouraged by the Italian master to turn his attention to landscape painting. 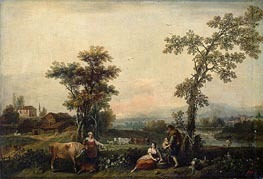 Between 1751 -1762, Zuccarelli was in London, where his light, facile style of landscape painting and picturesque views peopled with contadine greatly appealed to the taste of King George III, and won him immense popularity and success. There are numerous paintings by Zuccarelli in the Royal Collection at Windsor Castle. He visited London again in 1765, and was elected a foundation member of the Royal Academy in 1768. He then returned to Venice in 1771, and became President of the Venetian Academy. The work of Zuccarelli is represented in several museums including the Hermitage, St Petersburg, the National Museum, Berlin and the Victoria and Albert Museum, London.